How to get it and boost your mileage! Want cheap gas? Looking for ways to save as the prices keep shooting through the roof? Just read the news. According to a recent survey by AAA, 84% of Americans say the rising gas prices are changing the way they drive. Despite temporary drops here or there, don't expect a permanent break at the pumps anytime soon. So soaring gas prices have made many Americans rethink their vacation plans. But I love a good bargain, so when I see prices start to rocket-- particularly prices that affect my travel plans-- I take it as a personal quest to find the best gasoline deals out there. So I set out on my gas-price-busting quest. I found a variety of online services that will help you find the best deal around. They include deal-finding sites, widgets, and sites offering fuel economy tips. Here's what I found. Keep reading for cheap gas apps, cash back programs, and hotel stays that give you a free gas card! Your first line of defense is to shop around. Gas prices can vary by as much as 20-30 cents per gallon from station to station. So be sure to check a website or app that specializes in finding you the lowest prices in town. Just type in your zip code and it'll bring back the lowest cheap gas stations in that area. Find the one you want, click another button, and voila...they map the location for you. Prices are updated as often as every 48 hours. How do they do it? People like you...concerned consumers willing to note gas prices as they're driving around, then share that information with www.gasbuddy.com. They break down the prices by regular, mid, premium, and even diesel. And there's so much more. The latest gas news headlines. Links to check the latest home heating oil and crude oil prices. Trends in pump prices. An eye-opening overview of how fuel taxes vary by state. You have to link their card to your checking account. They only offer $.05 back per gallon (after the first use) and you get it back in points (not cash) which can only be redeemed on stuff at Shopyourway.com. While they have some good reviews, they have a lot of bad ones. Bottom line: For me, I feel that GasBuddy is a great tool for finding low gas prices near me, but is not worth the hassle of getting their card. Here is the app I prefer for getting cheap gas. The downside is that it is so far only available for stations in Virginia, the DC metro area, Maryland, Delaware, parts of South Florida and Tampa, and parts of North Carolina. If those areas work for you, keep reading! This free app lets you save up to $.03 to as much as $.18 per gallon. Open the app to see what stations are offering the best cash back deals in your area (you may have several options, or none in your area at any one time), then claim an offer (you have four hours to actually get the gas before the offer expires). Gas up as you normally would. Next, take a picture of the receipt and upload it to the app. Note: You must use a credit card to purchase the gas. Cash and gift cards won't work. Get Upside keeps track of what you've saved and when you reach a certain amount, they'll send you payment via Paypal. I like it because it's simple, I'm getting actual cash back, and I can also get additional cash back when I refer friends and they buy gas. Speaking of which, feel free to use my Get Upside Invite Code when you sign up: 4AZP2. Full disclosure-- I'll get $.01 a gallon cash back when you fill up but it won't cost you anything. Don't want to use my code? No problem! I just hope you enjoy saving money on gas. As gas prices shoot up, more and more places are offering gas card deals. But are they are good deal? Particularly in the summer, Quality Inns, Comfort Inns, and Choice Hotels, and Courtyard by Marriott frequently offer deals like a free $50 gas card if you stay two nights. However, if you subtract the value of the gas card, you may find that the room rate is higher than the "best available" rate at the hotel. So if you're considering these offers, be sure to check whether it really is a deal. Consider a Gas Rewards Credit Card - A variety of credit cards offer cash back deals or points on gas purchases. Moneycrashers.com is one site that allows you to compare the different gas rewards cards to see which one works best for you. 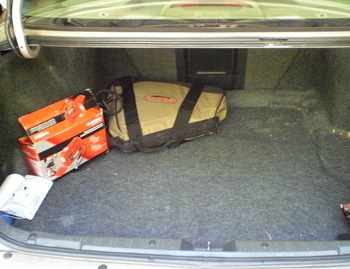 Travel Light - Lighten up that trunk! 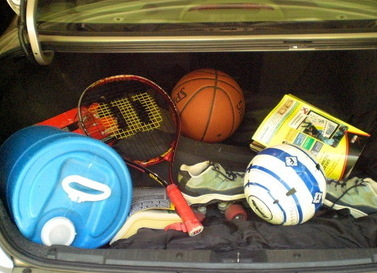 Do you really need to keep all those books, heavy winter boots, and other junk in the trunk? Compare this trunk to the one at the top of the page. Which one looks more like yours? In this version, I've only left in car emergency supplies (like jumper cables and a portable tire inflator). Dump out the junk. Remember: the heavier the load, the worse the mileage. Ease up on the Pedal - I know. I found it hard to believe too, but it really is true. The faster you drive, the worse the mileage. Every 5 mph you drive over 60 mph is like paying an extra $0.20 per gallon for gas!So stick to the speed limit (okay, maybe a few miles over on the freeway...). Added benefits? No speeding tickets and lower insurance rates! Keep 'em Inflated - Picture yourself out on a long walk. You can choose between old flip flops or a good pair of walking shoes. What will get you there faster and with less effort? Not those poorly-cushioned flip flops. It's the same with your car. 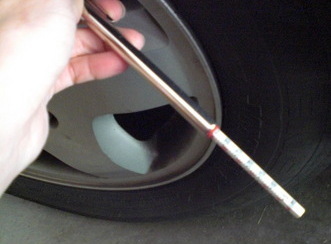 Poorly inflated tires are proven to reduce your gas mileage, as is driving in a car that needs an oil change or isn't in good condition. Turn it Off - Letting you car idle (i.e., keeping it running when it doesn't need to be) is like pouring money down the drain. I once had a friend who loved to stop by and visit for 20 minutes or more...all the while leaving her car running in my driveway while she was in my house. I can't imagine how much gas she must have wasted each year! Waiting for your sweetie while she runs in the store for a minute? Park it. Turn it off. 'Nuff said. Looking for more ways to save, including on entertainment and eating out? Check out my Discount Travel & Entertainment Deals page and my Free/Cheap Things to Do page. Paramounts Kings Dominion for as Little as $19.99! Busch Gardens Williamsburg Discount Tickets!